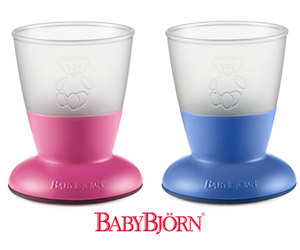 BABYBJÖRN Cup is the perfect first cup for your child, specially designed for tiny hands and a strong will to ”do it myself”. The cup’s ergonomic design, with easy to grip materials and soft, distinct shapes helps baby learn to drink from an open glass, just like mum and dad. The cup is pleasant to hold, rests firmly on the table and is hard to knock over. Its playful color and shape brighten up your kitchen table and it matches BABYBJÖRN Plate and Spoon nicely. A safe, tried and tested quality product, developed in close collaboration with pediatricians, industrial designers, children and parents. Ergonomic design, specially adapted for small children’s hands and way of drinking. Easy to grip materials and a rounded rim that feels soft against baby’s lips. Rests firmly on the table thanks to low center of gravity and wide base, with a rubber strip on the bottom. Unique design with a rim on the bottom’s outer edge, which allows the cup to slide instead of falling over when your child knocks it or pushes it. Frosted plastic glass makes it easy for an adult to see how much liquid is in the cup, when helping the child. Holds 100 ml (3.4 fl oz). Great for feeding your child porridge, purée and similar. Graduated markings in ml and oz. The round shape of the inside of the cup is compatible with BABYBJÖRN Spoon, to make scooping up food as easy as possible. Made from durable, recyclable plastics. (PP and TPE). Contains no BPA or phthalates. Easy to wash by hand or in the dishwasher. Suitable for microwave and freezer safe. Win a BabyBjorn Cup. Last date for entries is April 10, 2011.